I have been secretly working on a very exciting project on over the past many months - Introducing the Quilt Big Aurifil Thread Collection. 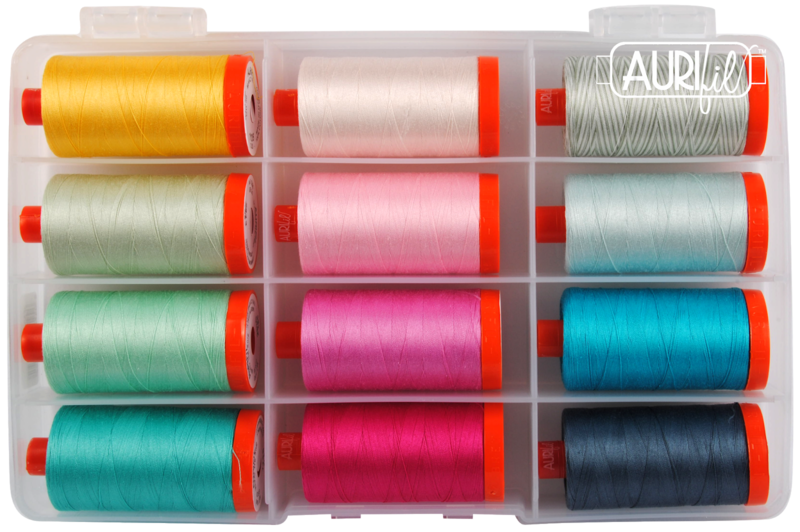 For many years now I have been using and promoting Aurifil Thread. I have been an #aurifilartisan and love sharing how wonderful I find this thread to be. So, insert squeals of excitement when the opportunity arose for me to curate my own Thread Collection. 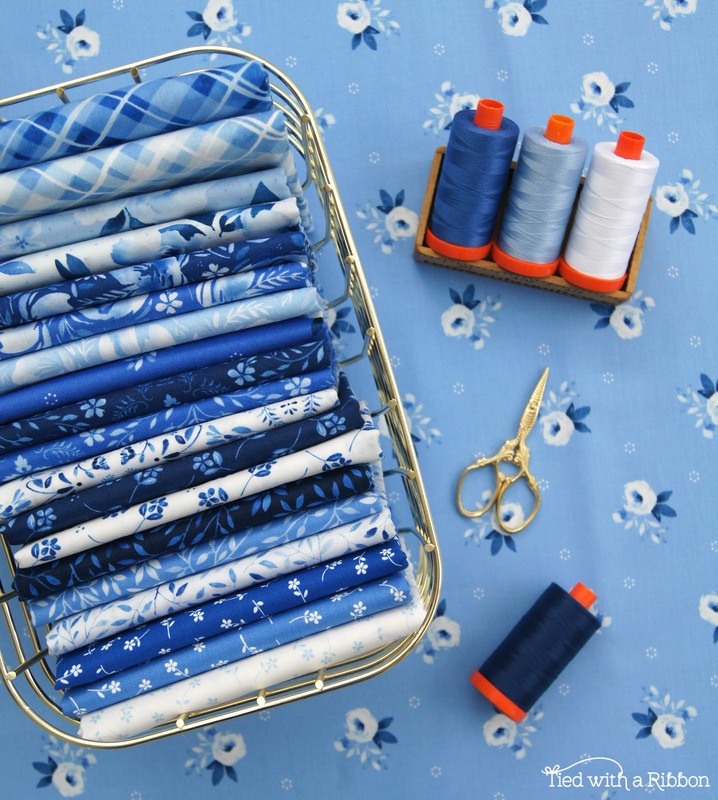 The collection consists of 12 Large Spools in 50wt thread - just perfect for all your piecing and quilting projects. 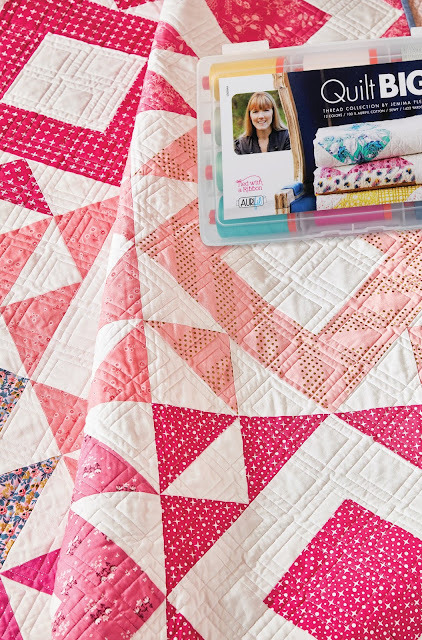 I wanted the collection to include my go to colours for the piecing and the colours I love to use for when I Machine Quilt and Bind my quilts and projects. And of course you don't have to be making a project from my Book - Quilt Big to love this collection. 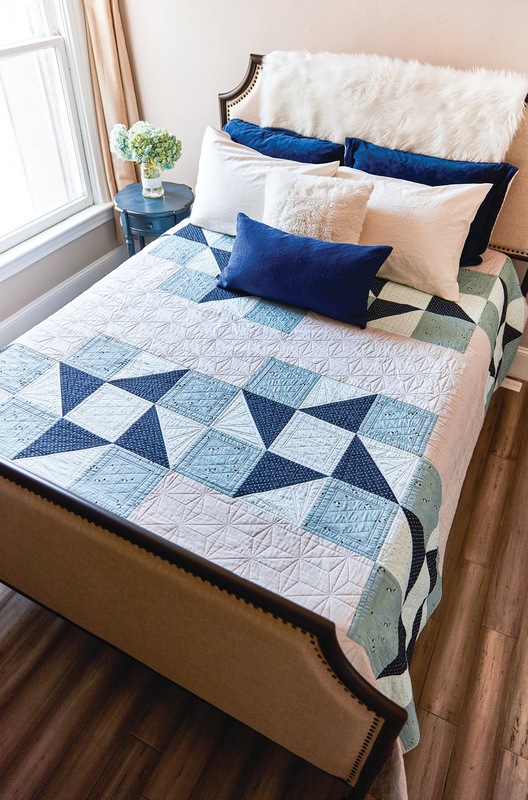 The collection was launched at Houston Quilt Market and already has started shipping to stores Internationally and here in Australia. You can check out the Interview I did with Aurifil Thread all about the collection and how it came about. While I used these threads to co-ordinate and work with the Quilts in my Book - Quilt Big - this is a collection you will be able to use to build you stash of sewing thread colours and introduce you to some new ones. At the recent Australian Quilt Market (AQM) here was my collection on the Aurifil Australia Booth. Its here! Its finally here. 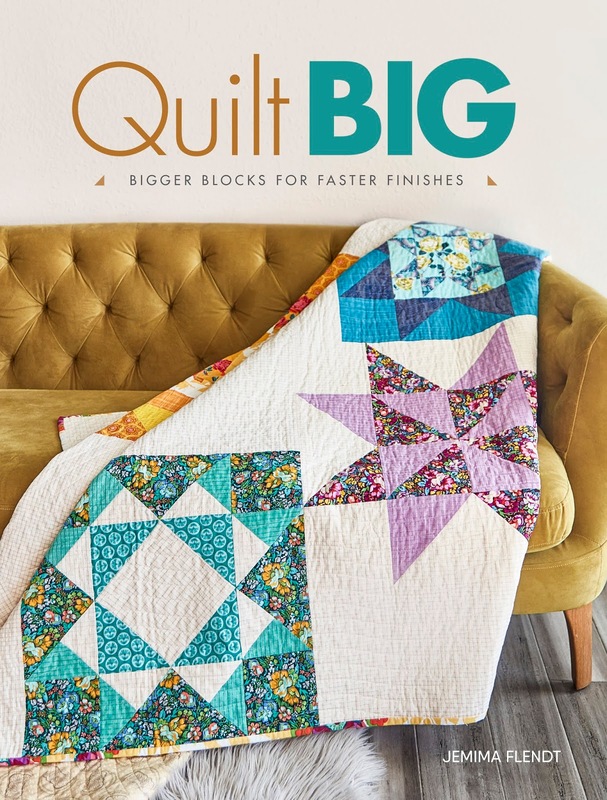 In the follow up to Weekend Quilting - Quilt Big has finally been released and I can not wait to share with you all the Projects and ideas behind this second book of mine. 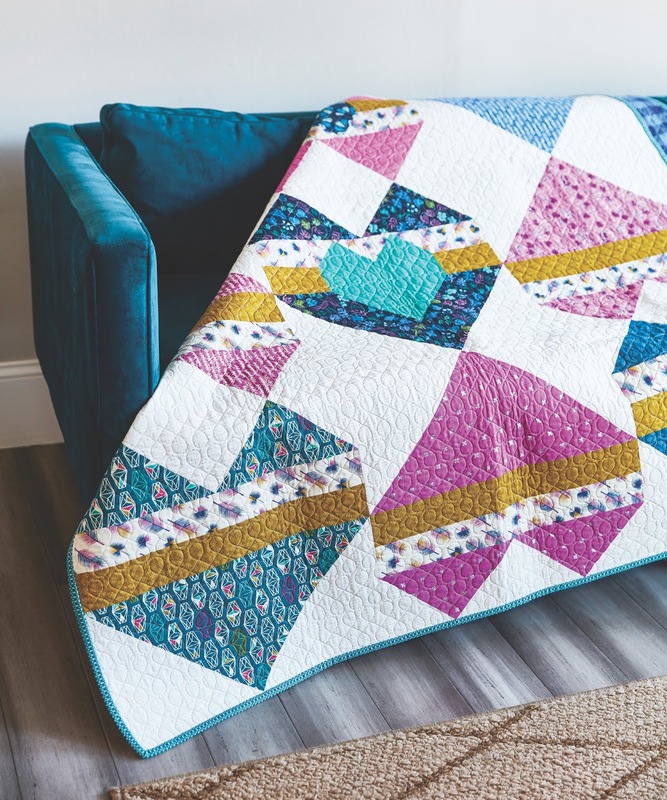 The concept behind Quilt Big was to take Traditional Blocks, super size them and then design projects with these blocks that would make the Bigger blocks - faster finishes! I have taken 22 Traditional Blocks and given them a modern makeover with the projects in this book. All beginner friendly as I walk you through how to make each block with simple directions, illustrations and photographs. There are then 17 projects for you to make with these blocks. 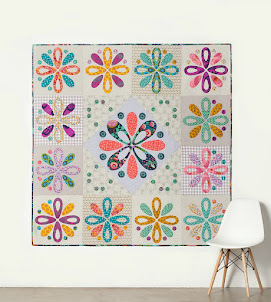 No matter whether you are a beginner quilter or more advanced - you will love making these projects in next to no time. 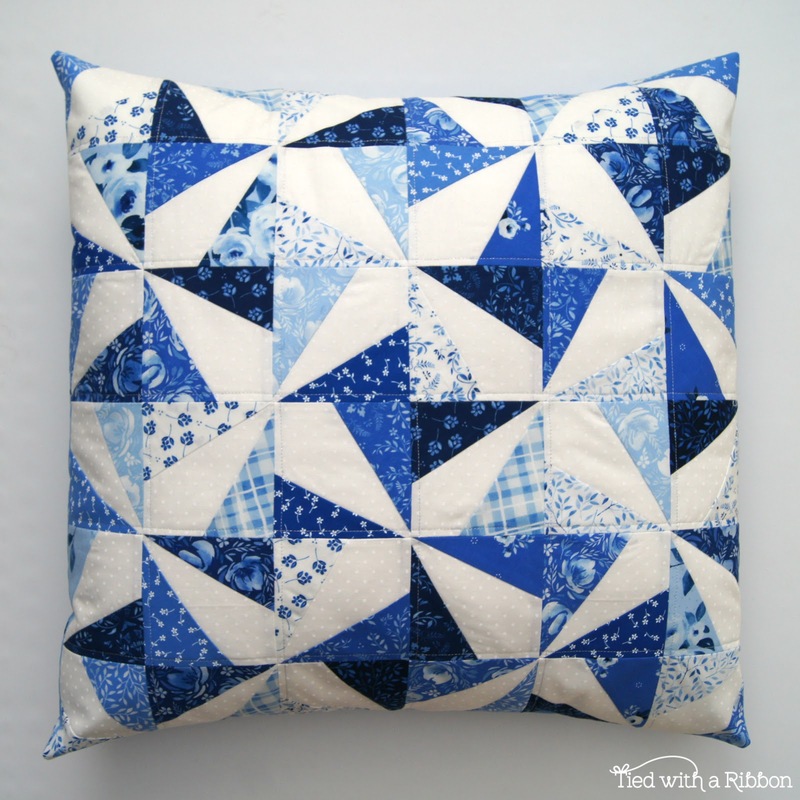 Choose from Quilts, Pillow or a Runner to make. The best part is that with the large Block sizes many of the projects are interchangeable simply by changing out a block of the same size for another. 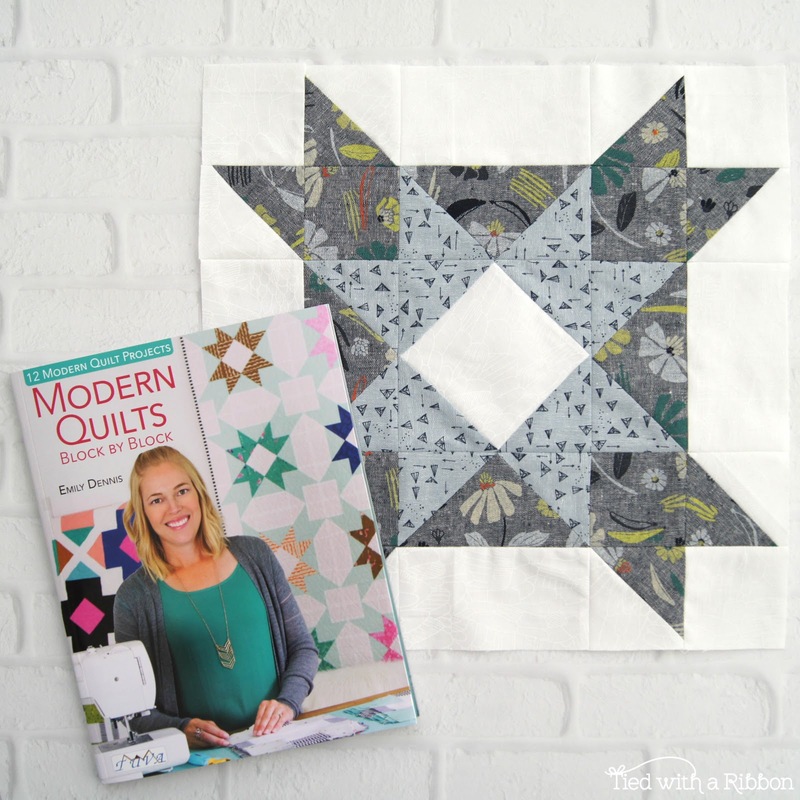 So the possibilities really are to you - use this book as a building tool to grow and develop your quilting skills. When it comes to quilt blocks, bigger can be better and faster. 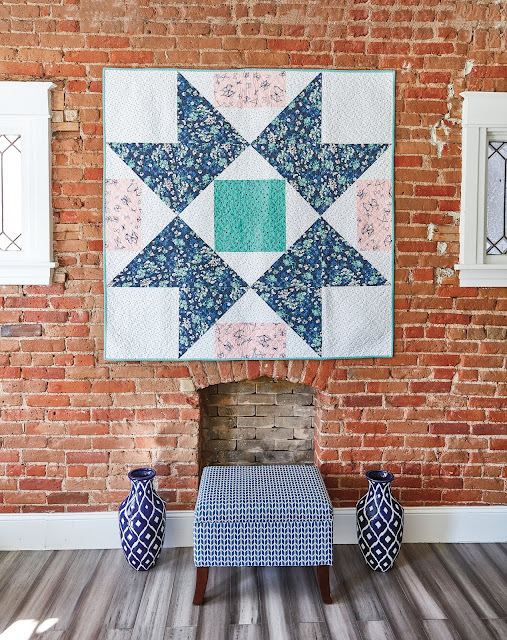 In Quilt Big, I show you how to scale up classic blocks like the Log Cabin, Flying Geese, Indian Star, Home Treasure and more to create gorgeous quilts and projects for you home or loved ones that showcase your favourite fabrics and large scale prints. 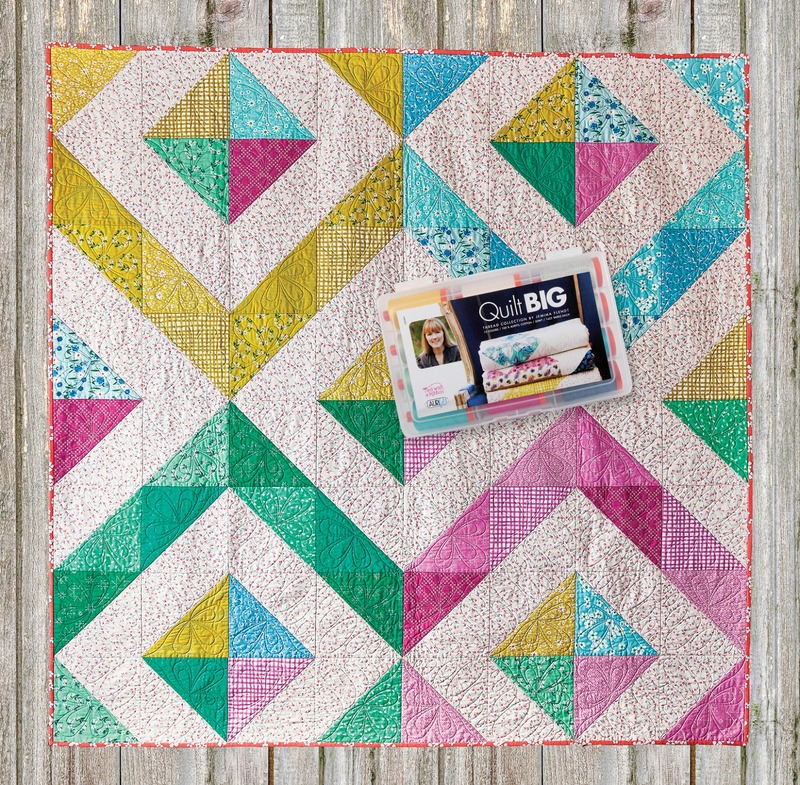 Quilt Big really is all about maximum impact in minimal time. 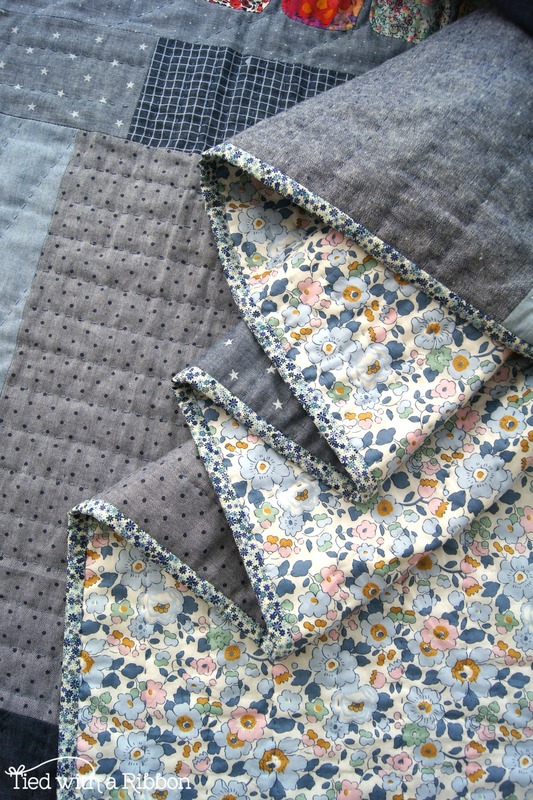 There is also a chapter on Quilt Backings. I really do believe that after all the thought, effort, time and love that goes into the making of a Quilt top, the back of your quilt also needs more than minimal attention. 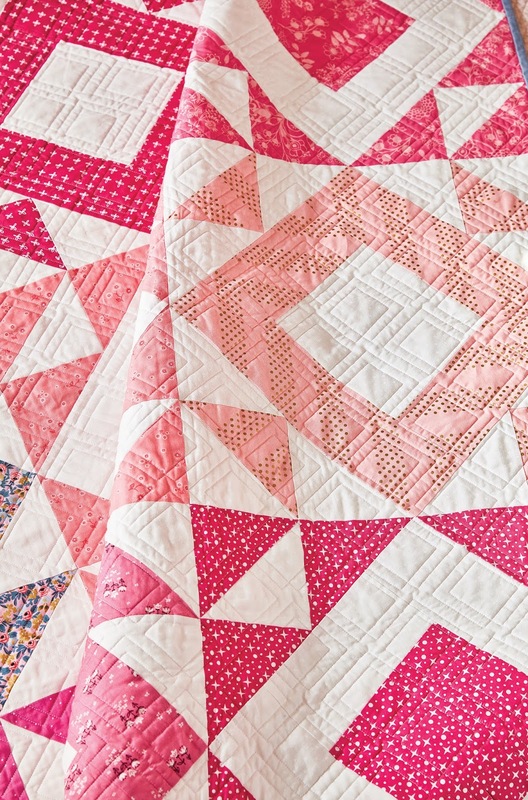 There are so many ways to make the back of your quilt just as striking as the front. 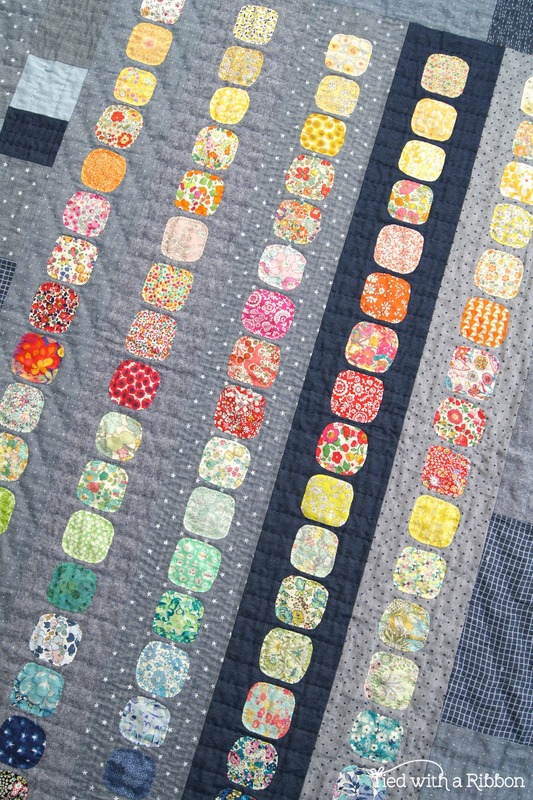 In doing so you make your quilt design reversible so there is even more to love about your finished quilt. 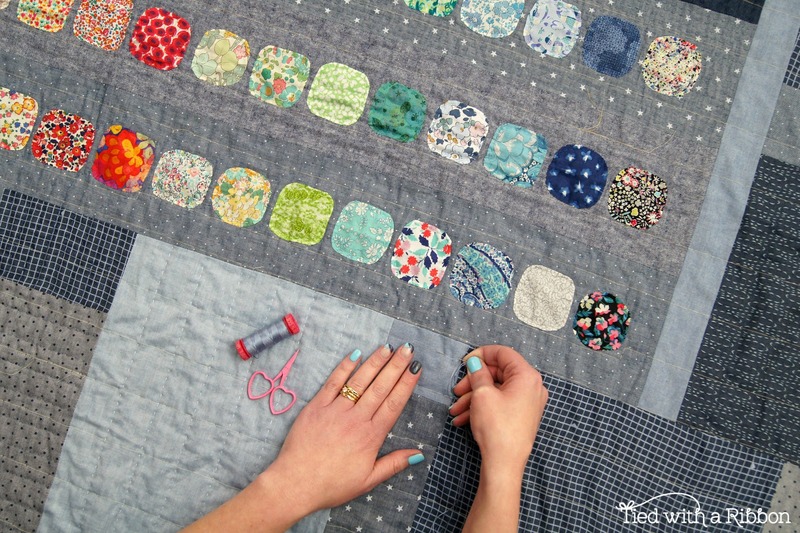 The backing of your Quilt is also a great place to use up some of the left-over pieces of fabrics from your quilt top - a great way to tie the two sides together and I give you several ideas on how to do this. 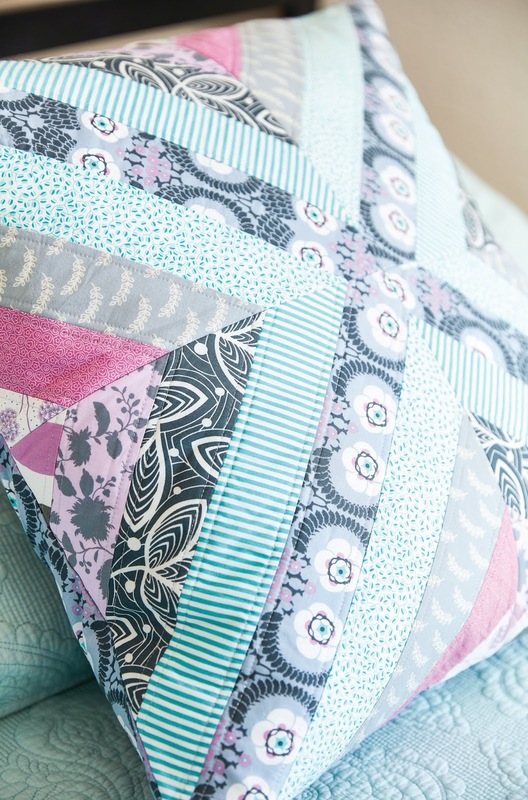 Not only are there larger projects to make such as Quilts but there are smaller style projects to make such as this Strip Pillow. 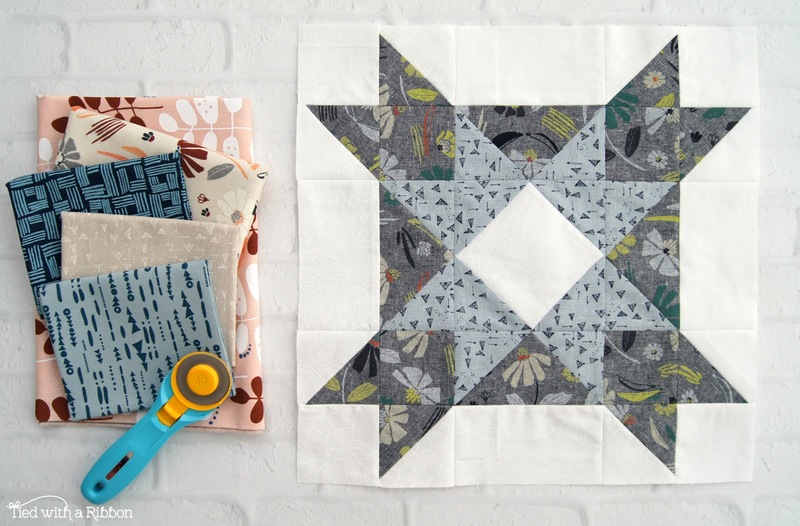 Striking blocks can also be made in a short amount of time to create projects that are smaller in size. 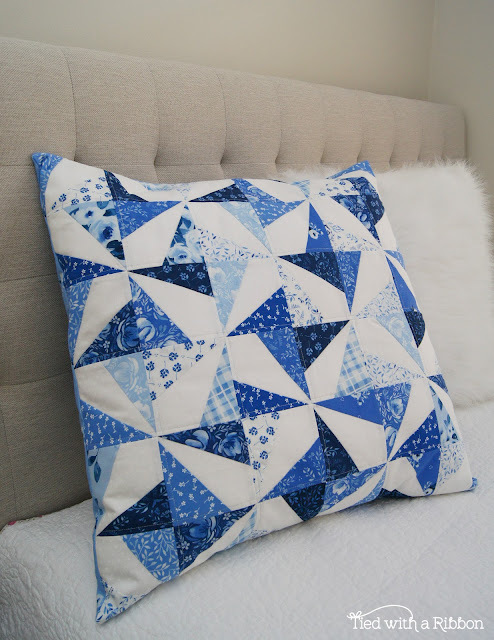 Pillows make great gifts to make, are a great way to learn a technique, will spruce up a spot on a bed or couch. Pillows are a great way also to use up scraps and leftover fabrics from quilt projects. 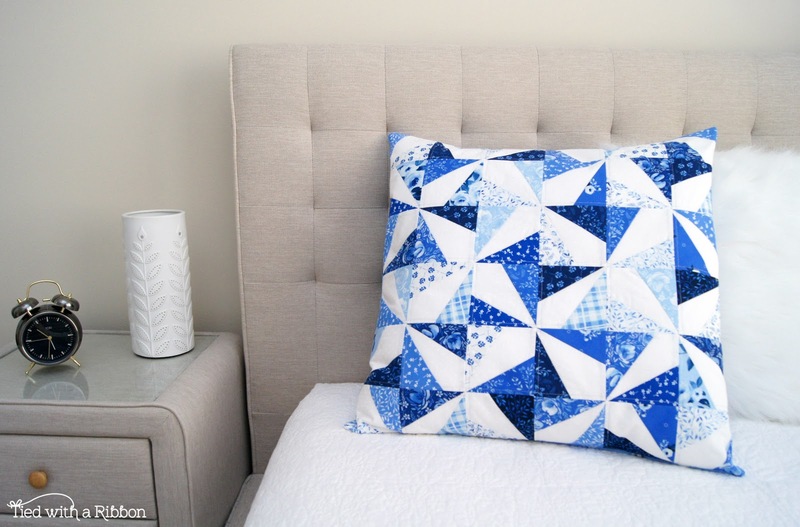 You can then even make a matching pillow to a quilt project to completely finish off a project. Quilt Book is out now and I am going to come back and share more projects and more about the book next week. 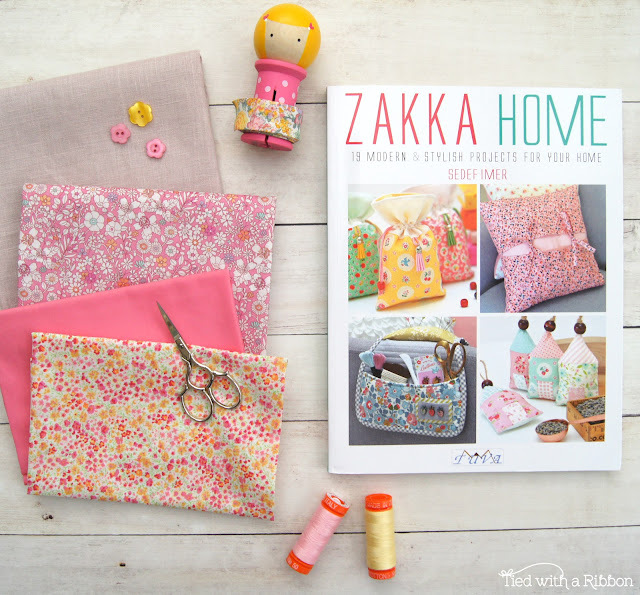 I wanted to say a BIG thank you to the following companies who came on board for this book - Cotton and Steel, Ella Blue, Aurifil, Fat Quarter Shop and Ministry of Fabric. Thank you all so much. 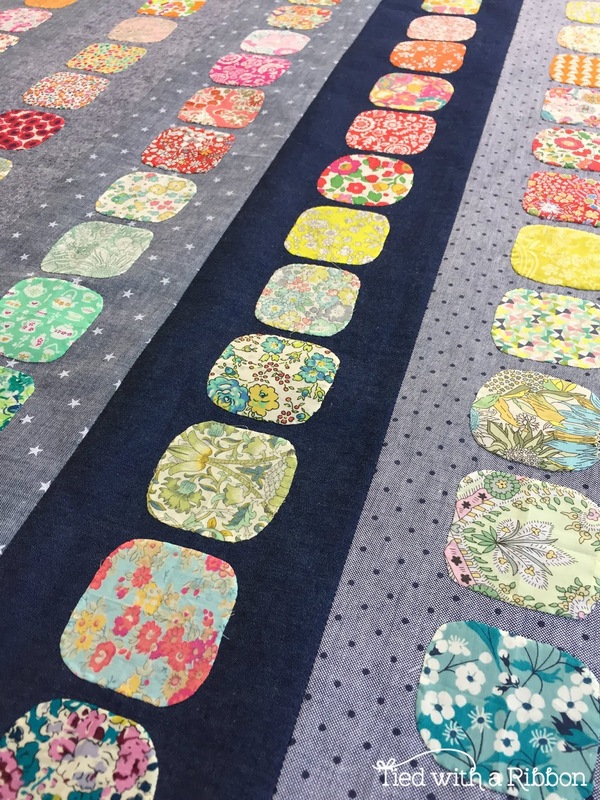 Carol Brady from The Quilting Cottage - well you have been so amazing in the Quilting of so many of the Quilts from Quilt Big. You really have gone above and beyond to make these Quilts look spectacular and for all the work you put in - I am very grateful. Thank you ever so much. 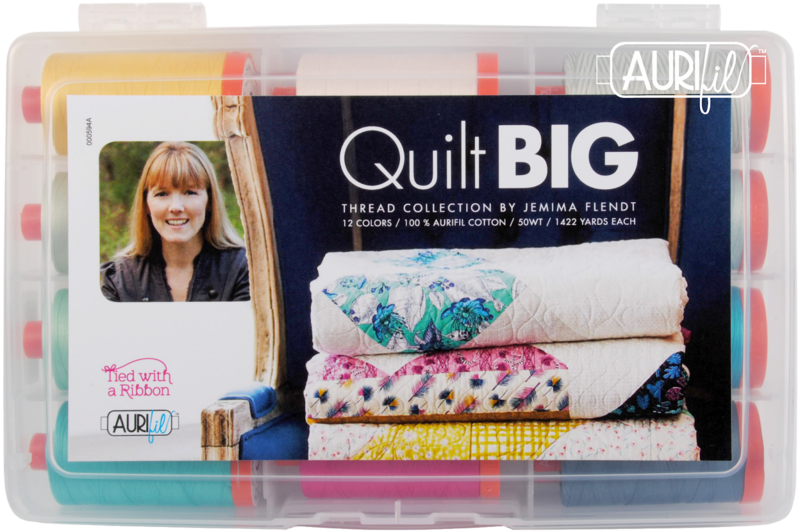 There will be so much more to share with Quilt Big, starting in January there will be a Book Tour showcasing some of my favourite makers, making Quilt Big projects, there will be Giveaways, The Aurifil Thread Collection debut and so much more to share so stay tuned. Check out the #quiltbig and #quiltbigbook hashtags to see what people are already beginning to create. You can have a copy of Quilt Big in time to place under your Christmas Tree. 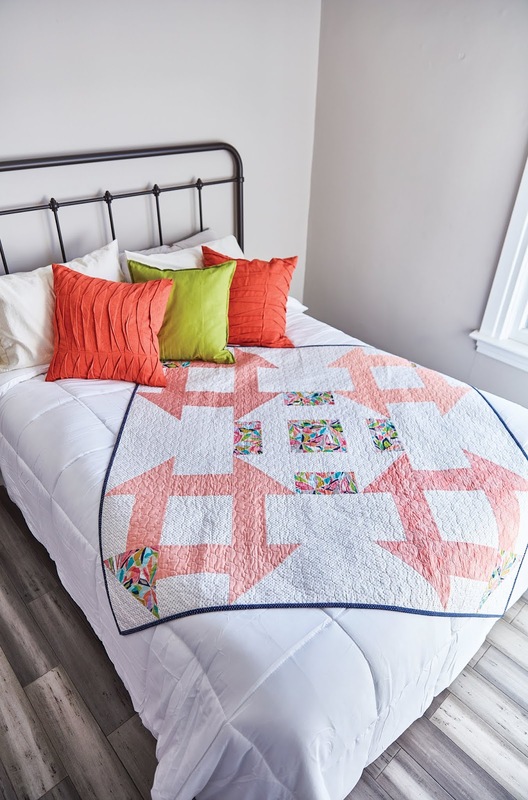 It is also available here at Amazon and The Quilting Company. For Wholesale Inquiries you can check out Checker Distributors in the US and Creative Abundance and Peribo Books in Aus. Have you seen the very talented and amazing Fabric Collections by Briar Hill Designs. Caverly and Julia are the duo behind this design team. 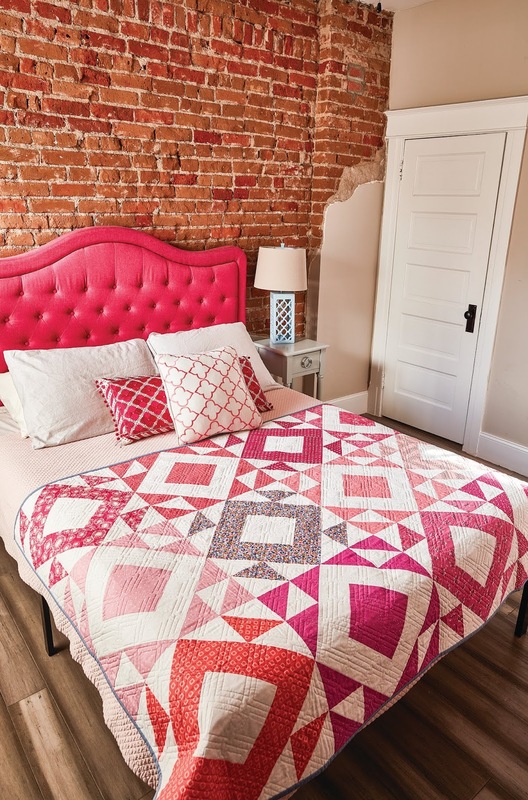 Caverly is the artist and Julia is the quilt designer which makes for a perfect pairing. 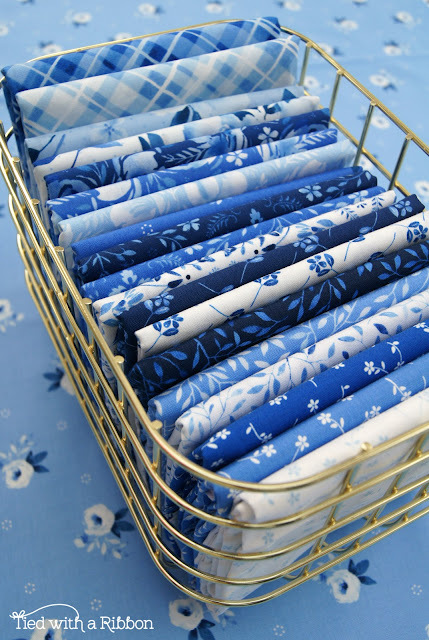 Bequest is their second range for RJR Fabrics which is shipping now. 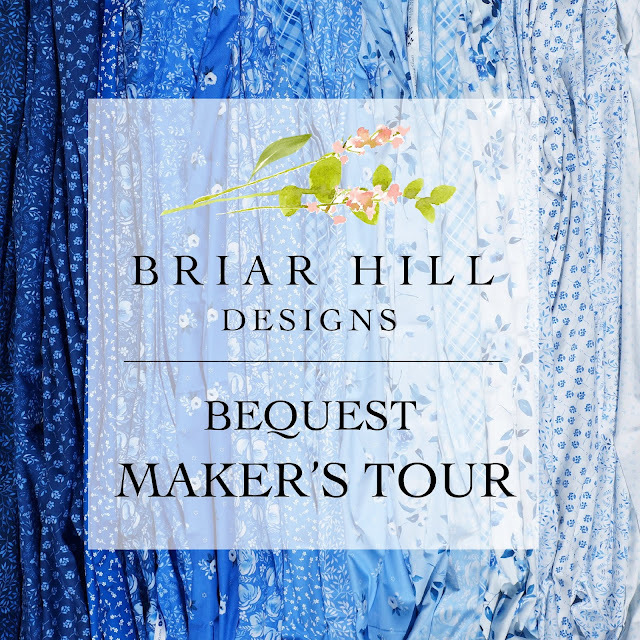 I am excited to be sharing with you today something I have made for the Makers Tour. For all those Floral Lovers then you will just adore this range in all the Blue and Whites making such a complimentary colour palette to these fabrics. 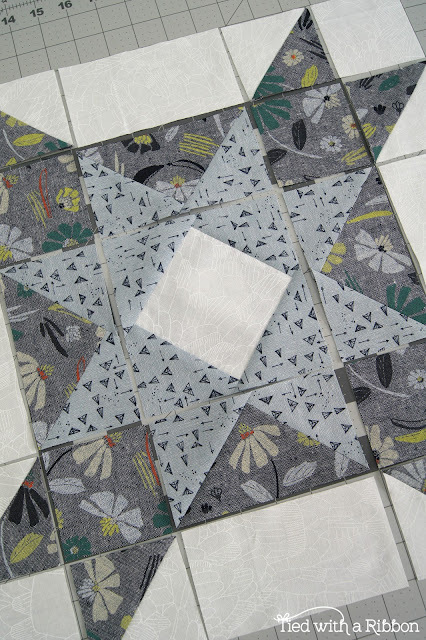 With large florals, small scale leaves along with geometric prints, this range has it all. The Watercolour styled designs make this range fresh all the while giving it that vintage country feel. "A Bequest is something given or transmitted from the past. An heirloom. A legacy. An antique. We used these precious items as our inspiration behind these 20 blue and white prints. Each of the print names go along with our theme: ‘Hope Chest’, ‘Looking Glass’, ‘Loom’, ‘Music Box’, etc. We had such a blast naming them." Deciding what to make will certainly be the hardest part. After lots of thought I decided to make one of my Confetti Cushions to showcase these stunning florals. Getting to work on cutting out these fabrics and then piecing was great fun, taking in the bespoke nature of these prints. With such a beautifully co-ordinated colour palette all the hard work is done and all the the colours and prints just work so well together. The story of the making of an Aerial Grove Quilt. 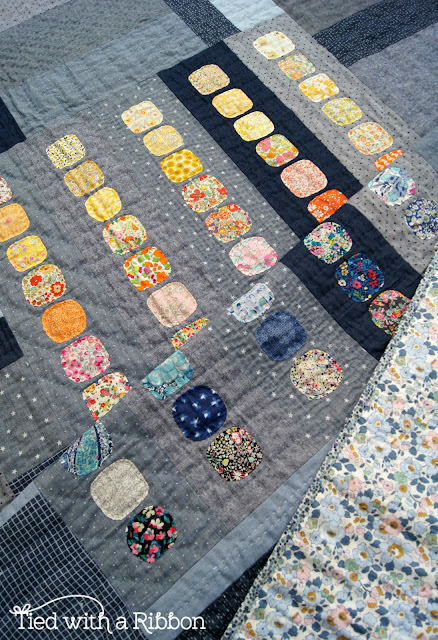 It was a long, long time ago when I decided to make an Aerial Grove Quilt. I fell in love with this pattern by Carolyn Friedlander from her book - Savour Each Stitch back in October 2016. I was smitten - I knew after reading the book from cover to cover that this was a quilt that I wanted to make for myself. First part was getting to choose all the fabrics I was going to use for my Needle turn "squircles". I went through my Liberty fabric stash and pulled out all the ones that made me so happy in a Rainbow colour way. 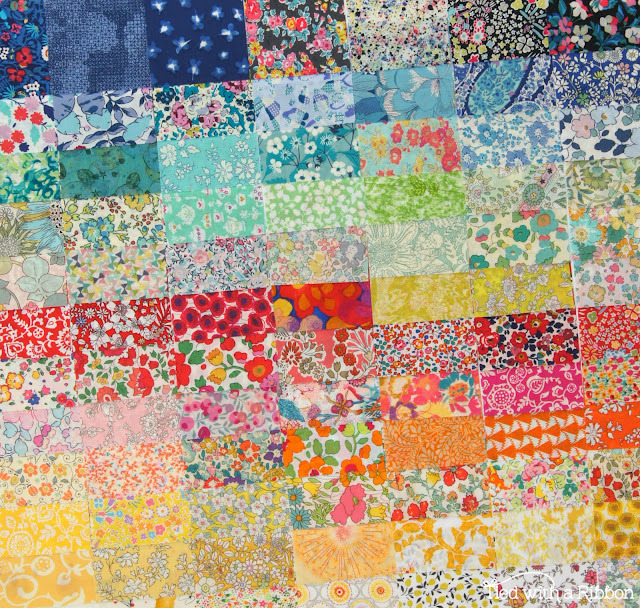 Cutting up this many Liberty squares actually took a while - to cut, press and then fold back up all these fabrics. It also made a wonderfully beautiful mess in my sewing room. 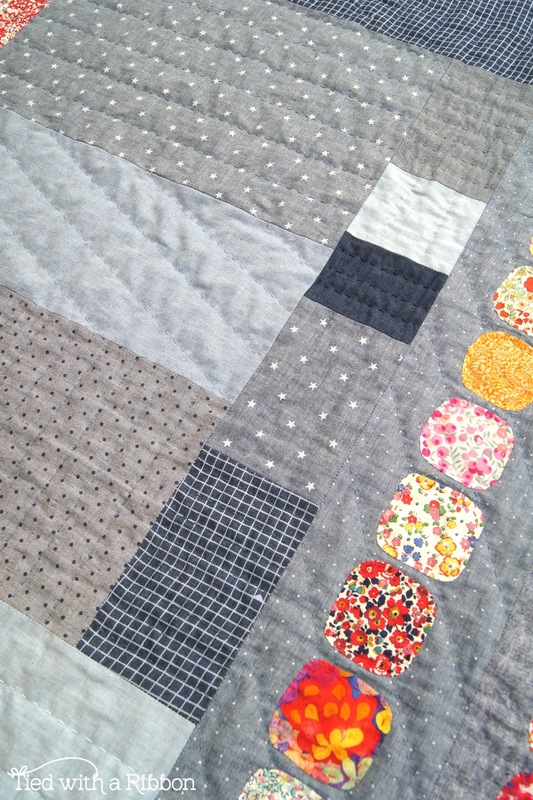 Next up was deciding what fabrics I was going to use for the backgrounds of this quilt. I wanted the quilt to go on our Bed, so although I had picked some very girly Liberty fabrics I then decided to try to make it more something also that my hubby would love on the bed too. 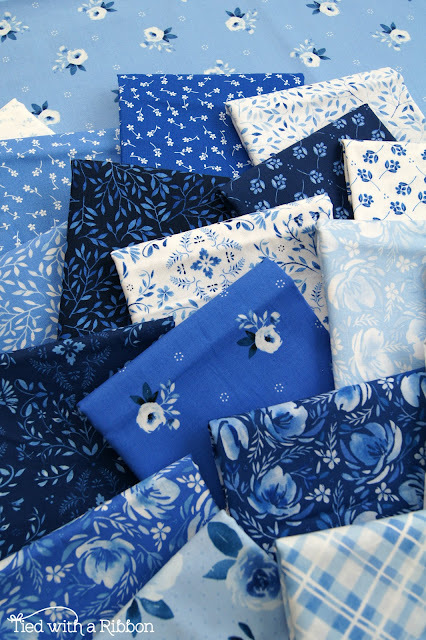 As a big lover of Denim and Chambray fabrics I had the perfect variety of lots of different prints and types of these Denims and Chambray's left from projects that I had already made. 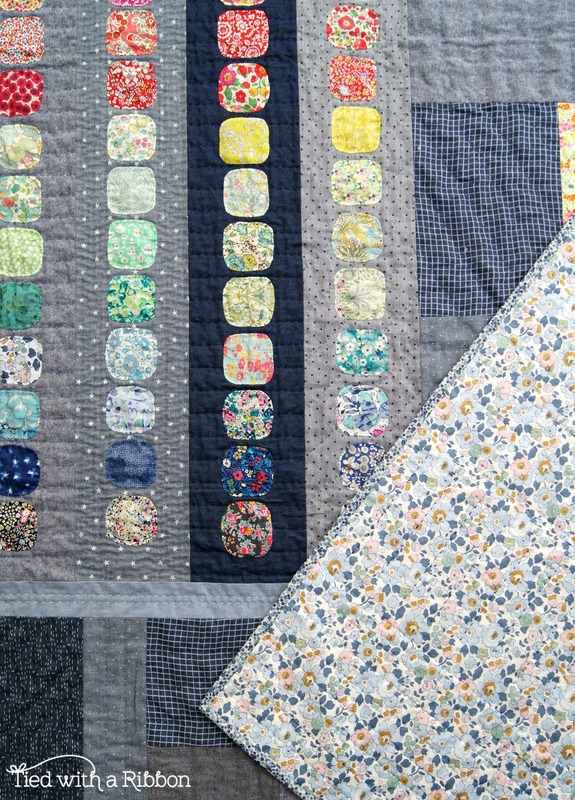 So, so far - I used the Liberty fabrics from my stash and the Denims/Chambray's also came from what I already had. I then spent the next year hand sewing all the squircles into place. The pieces even came on our Family Cruise in December 2017 to Vanuatu. 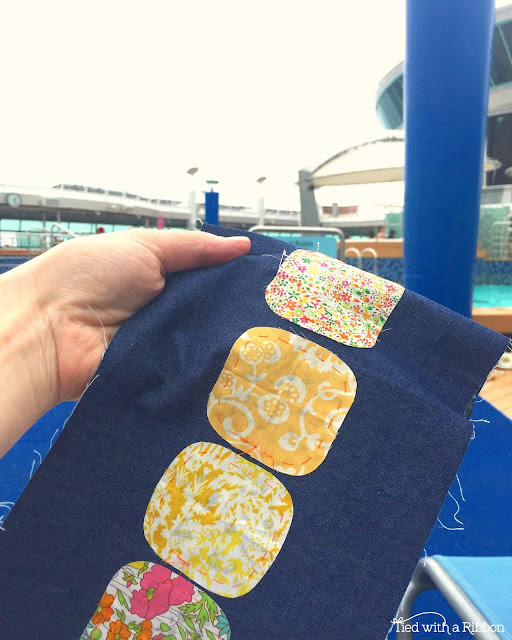 I had already basted down the Liberty squircles so this made the strips very portable and easy to take with me places when I had a chance to stitch. 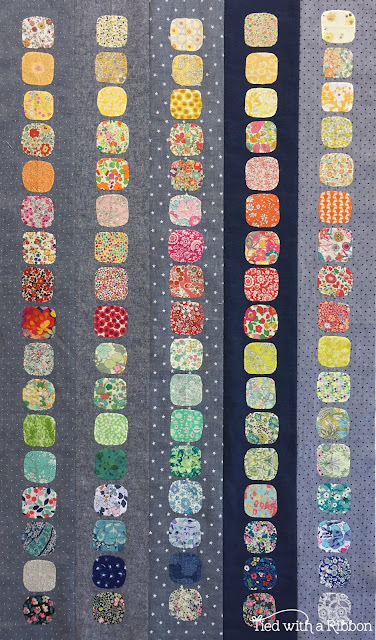 Early in 2018 I had finally finished the hand sewing of all those squircles and began to piece together the strips and background pieces of Denims and Chambray's. I began to build the quilt out using all the pieces of the Denims and Chambray's I had chosen to use. I was aiming for this to be quite large and worked it up to be 2.2m x 2.2m so big enough for our Queen size bed. I knew very early on that I was going to Hand quilt this quilt. 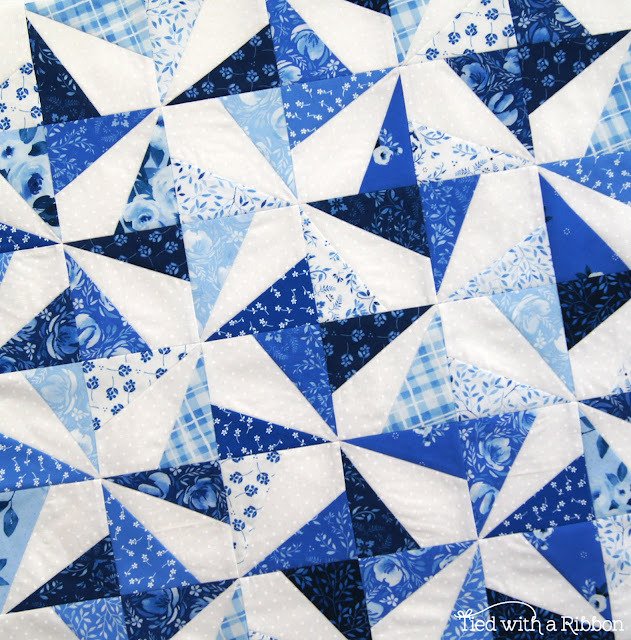 So I also cut the pieces for the blocks with this in mind so that I could use lots of smaller blocks to create the hand quilting design rather than leaving fabric pieces in larger squares and rectangles. In between the Denims and Chambray's I placed a few background blocks in Liberty fabrics to draw cohesion from the Liberty squircles that were in the centre. 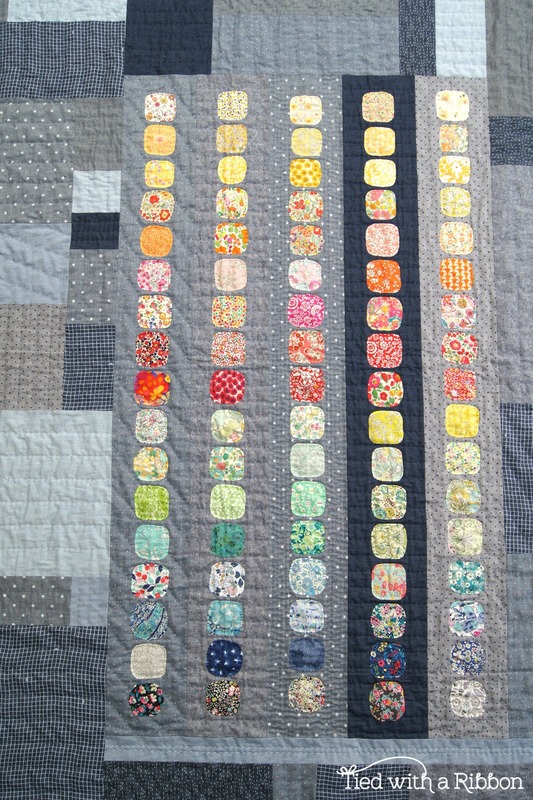 Next I sent the Quilt off to my Long Arm Quilter. 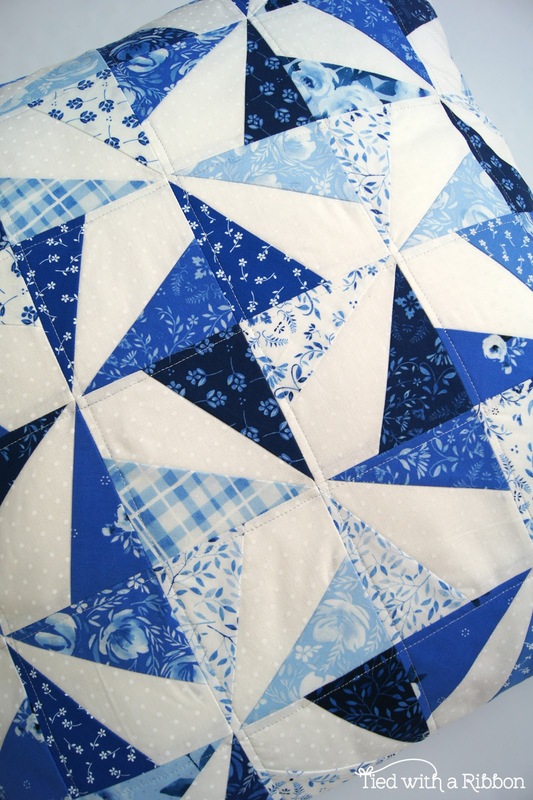 Because I knew this was a project that was going to take me a while to work on I had the quilt Basted. 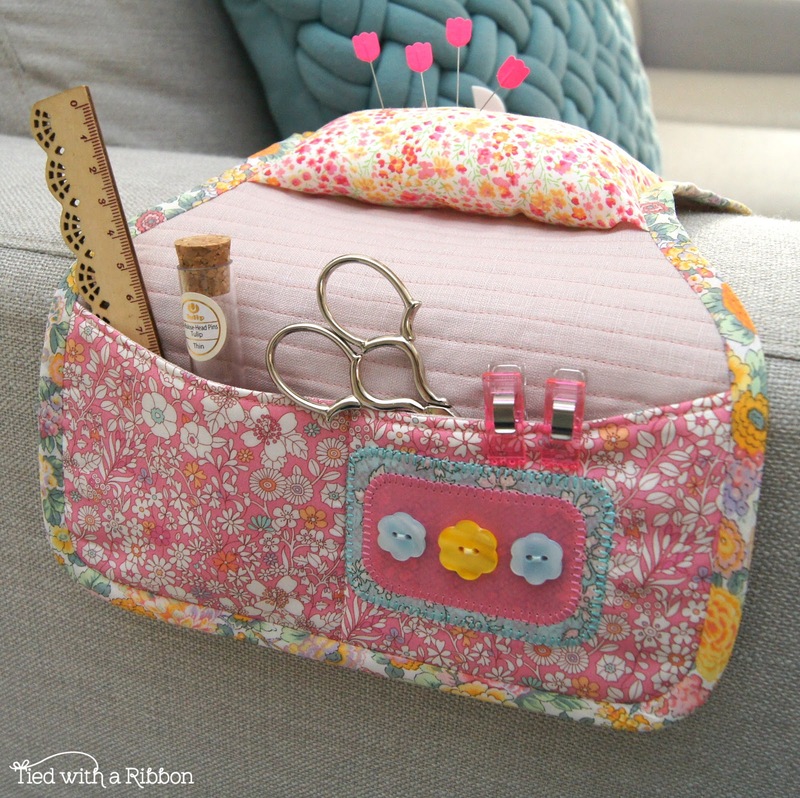 This would save me not only basting such a large Quilt myself but then I would not have to deal with the weight of the number of pins I knew this quilt would need for hand quilting. The next task was to collect up all the Thread I was going to use for the Hand quilting - this was the easy part - Aurifil 12wt. I chose about 8 different blue 12wt Thread colours and then matched each the fabrics to one of these colours so that I knew which fabric would be matching to which colour thread. With all my tools ready for Hand quilting - I then started what I knew would be a long and rewarding process. Over the years I have hand quilted many quilts - I love hand quilting, I find it relaxing and such a worthwhile way to add such a beautiful texture and feel to your quilt. 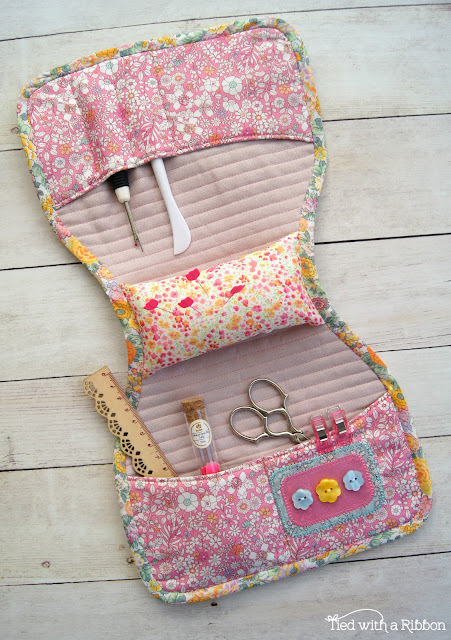 If you have wanted to give hand quilting a go or already love this part of quilting and would like some extra tips - here is a Blog post I wrote all about - My Favourite Hand Quilting Tools. Here you will find some helpful tips and tricks. I used a variety of different Masking tapes - 1/4in, 1/2in and 1inch tapes to help create the spaced lines which went horizontally, vertically or diagonally randomly throughout each background block. Once I could see the finish line almost in sight for all the hand quilting, I then went back to my Liberty stash and found some Binding that would go perfectly for that finishing touch to the quilt. Aren't Binding Babies ever so cute - always the perfect way to store your Bindings and so very helpful when it comes time to sew the Binding onto your Quilt. The Backing I choose to use for the Quilt - well that took a long time to decide what to go with. My first initial though was that I wanted to use Liberty. I knew that was an extravagant way to use this fabric and it was for the backing so I tried to work through other options. 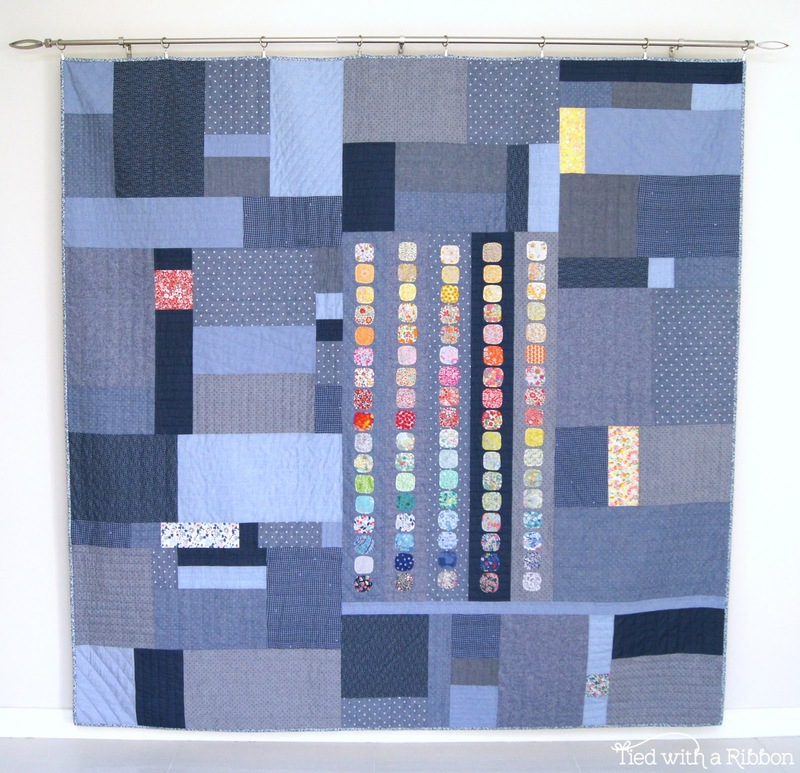 I looked at Widebacks, lots of different Chambray's and Denim options, I tried looking at yardage of regular Quilting cottons that I thought might work. It wasn't working for me. I had spied this Liberty Betsy in Denim from Ava and Neve and then just could get this out of my head to use this. 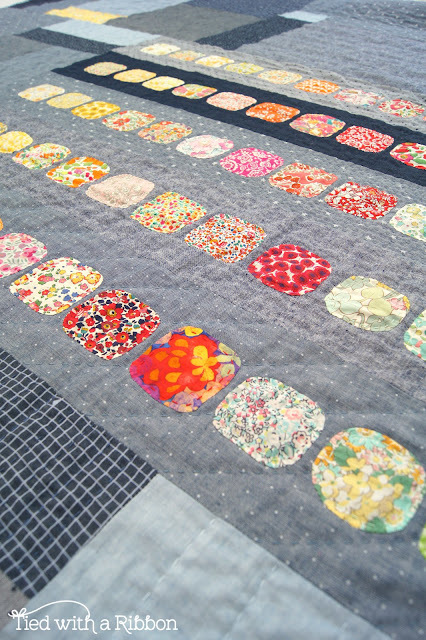 While it certainly was a luxury - I figured that this was going to be our quilt, all the fabric for the top had come from my stash and mostly I knew I would have regretted not using it. Within the first 10 seconds of opening up the package of the yardage of this Betsy I knew I had made the right decision. 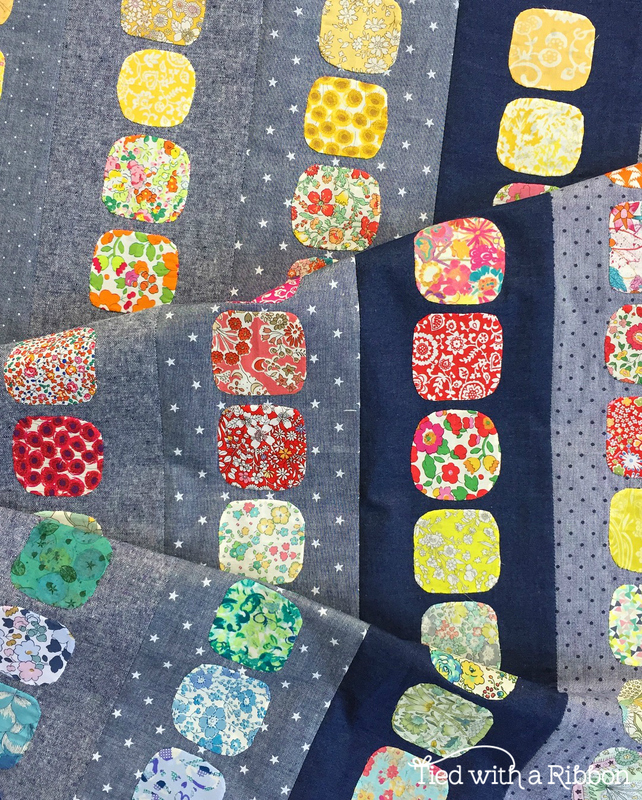 This Liberty was going to hand quilt up a dream, be so soft and have a much lighter weight to the overall quilt - especially as I had used the Denims and Chambray's on the front which are a little heavier than regular quilting cottons. I was in love! So all in all this quilt took about 2 years to make from beginning to end. Certainly a wonderful journey in hand sewing and hand quilting. 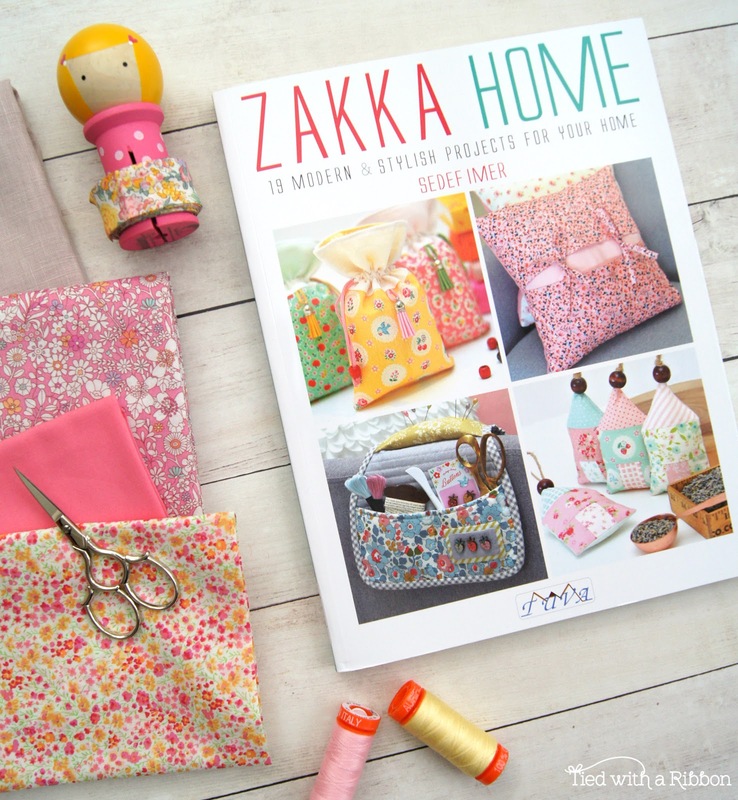 Sedef Imer of Down Grapevine Lane has just released her second book Zakka Home for Tuva Publishing - after the wonderful success of Quilt Petite, Sedef is back with another great title to add to your Quilting and Sewing Collection. 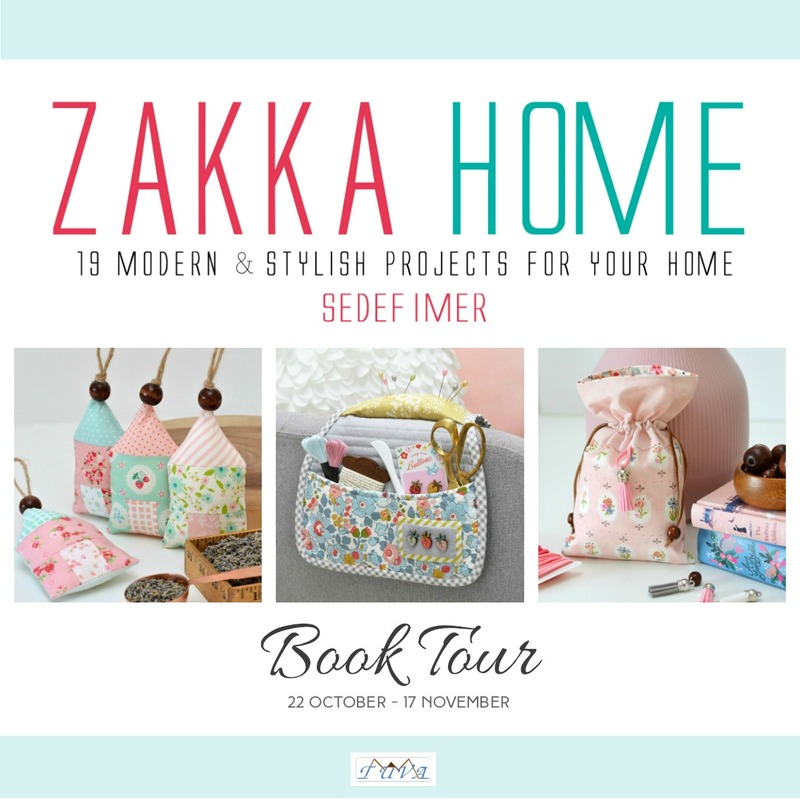 Zakka Home is filled with 19 "smaller style" projects to get you inspired to fill your home with beautifully handmade projects. From Pillows to Kitchenware items such as Tea Towels, Table Runners and Trivets, glorious Bags, sweet embroideries, sewing inspired items like Pincushions and an Armchair Caddy along with items to gift - there is something in this book for everyone to make no matter your level of experience. 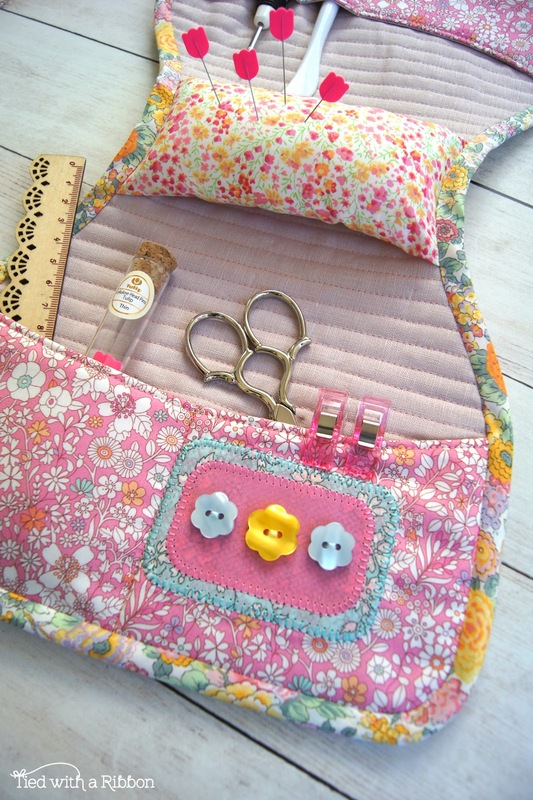 While it was hard to choose one project to make - I settled on making the Armchair Caddy as I knew I could put this to use straight away with all the Hand stitching and quilting I have been doing of late at night time while sitting on the couch. The Armchair Caddy is quick to make and after picking some of my favourite Alice Caroline Liberty fabrics paired with some blush 100%Linen and some pre-made liberty Bias Binding I was all set. The instructions are simple to follow and with full size pattern pieces included there is little prep to get yourself started. 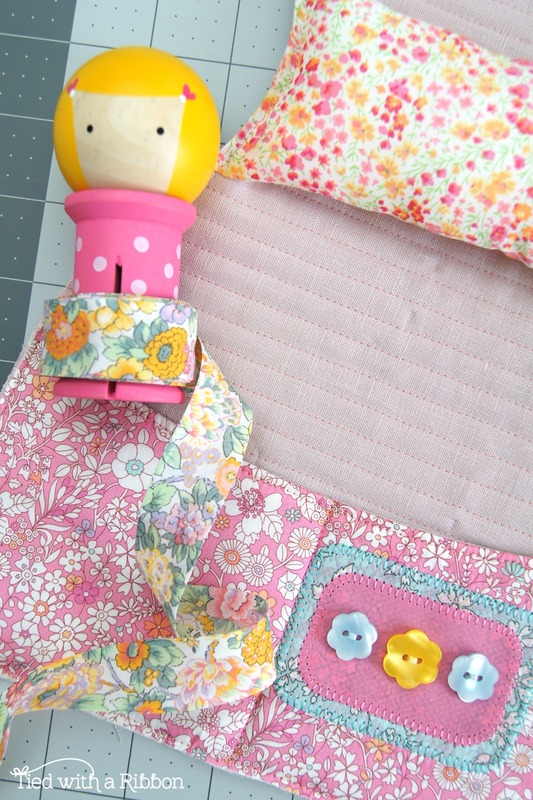 I decided that for the little pocket details I would Applique the Fabrics rectangles on and added these cute Flower buttons from my Button stash. My pre-made Liberty Binding also helped quicken the time to make this caddy as it was just the right width for the binding. I am so thrilled with how the Armchair caddy came up and it fits perfectly on the arm of my couch. This is going to be so useful and I can change what it needs to hold for each project I am working on. With Christmas coming up this book would make not only an excellent book to make lots of gifts for your friends and family but also a great gift for a craft friend. 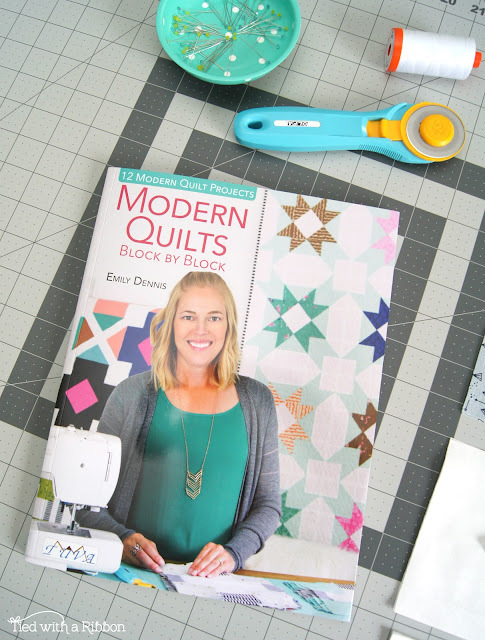 I'm excited to be sharing with you Emily Dennis of Quilty Love first Book - Modern Quilts - Block by Block for Tuva Publishing. I know how nerve wracking, writing and putting out there your own book is but Emily has knocked this one out of the Park. 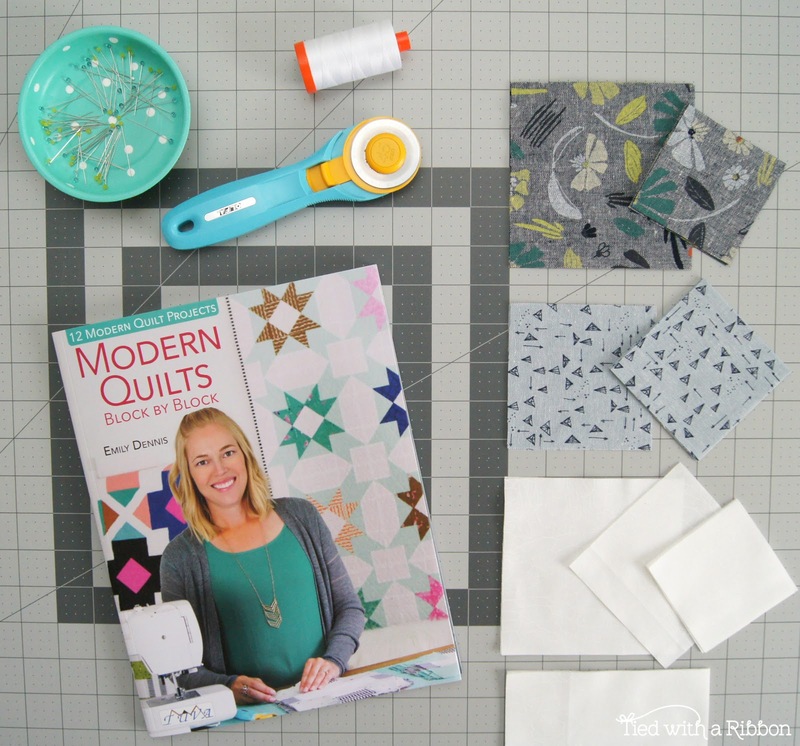 You will just love this book and certainly want to add it to your Quilt Library. 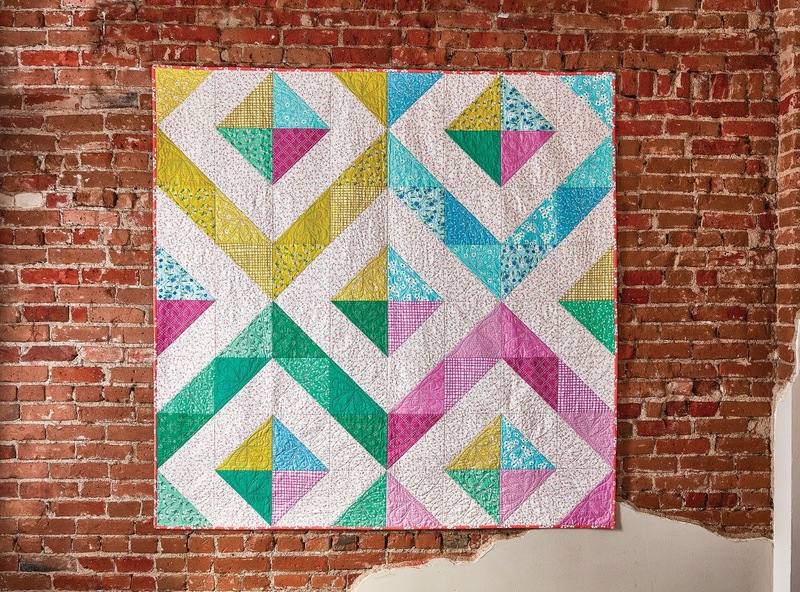 Modern Quilts showcases 12 projects with repeating Block designs to get you sewing. 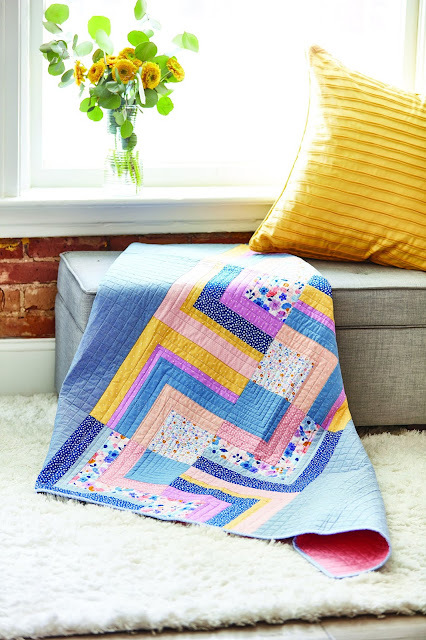 No matter whether this is your first quilt or have more experience, you will enjoy making the patterns from this book. 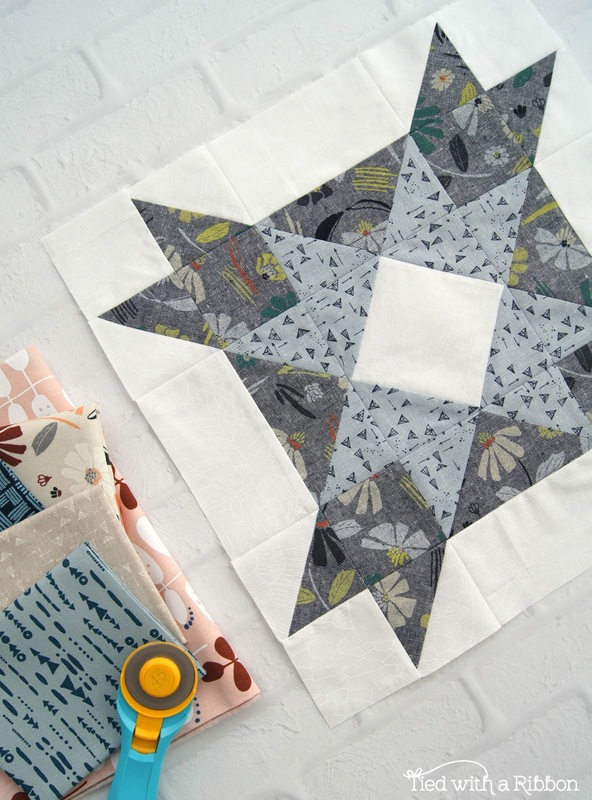 The pages are well laid out with beautiful colour pictures and diagrams to help you through your chosen quilt pattern. There is definitely a project in this book for everyone - no matter who you would like to make a quilt for you will find a beautiful pattern for just the right purpose. And just as Emily says in the forward - "Quilts are meant to be used and loved." 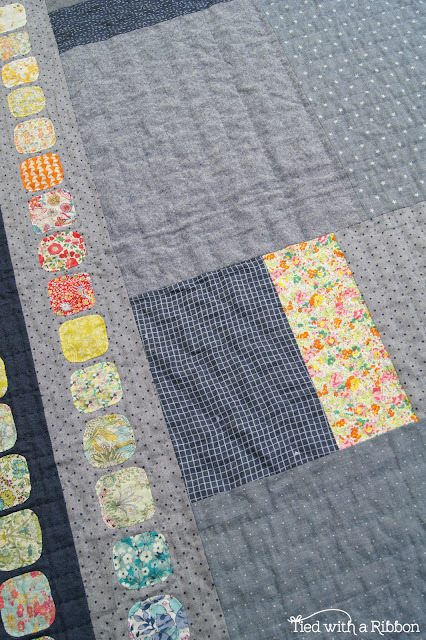 It was definitely hard to decide which Block to make but this one caught my eye from the cover of the book. This Quilt design is called "First Place" and I had just the right Bundle of fabrics sitting in readiness on my cutting table to make it. 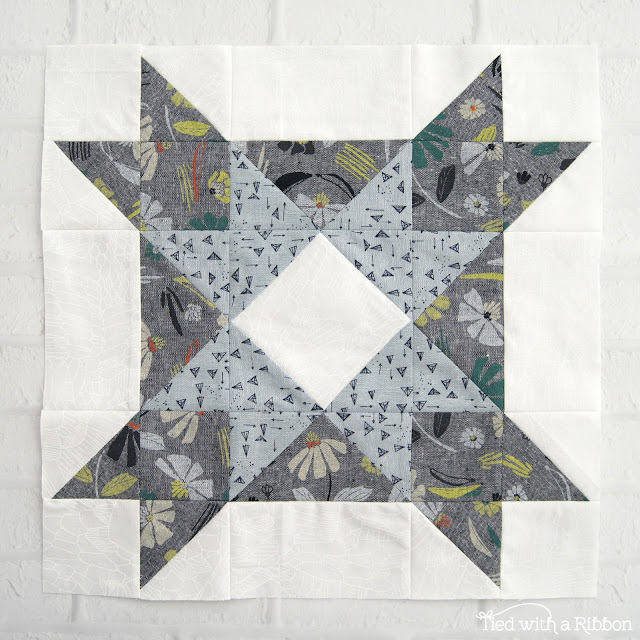 I have a FQ Bundle of Forage by Anna Graham of Noodlehead along with some Carolyn Friedlander fabric for my background and I was quickly set. This block was great fun and quick to make following along with the Instructions. 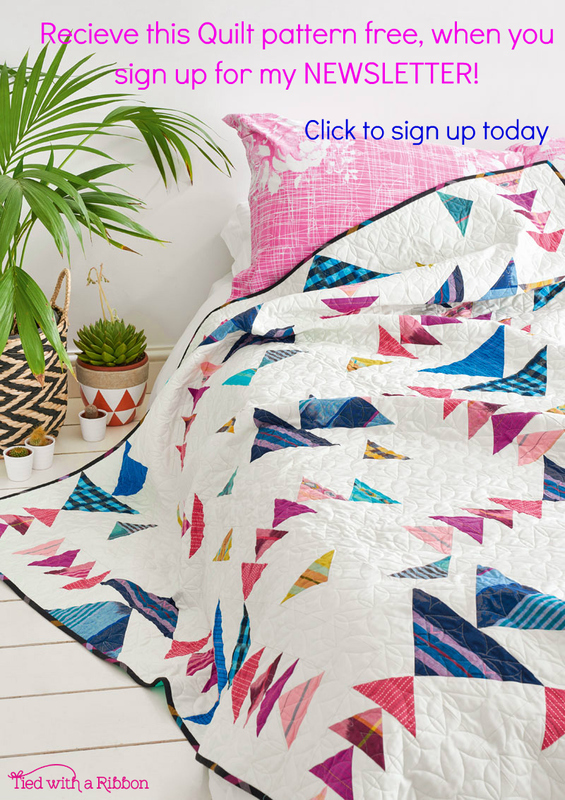 I love how the fabric repeats through the block and how striking this quilt will be in lots of different colour and fabric variations. 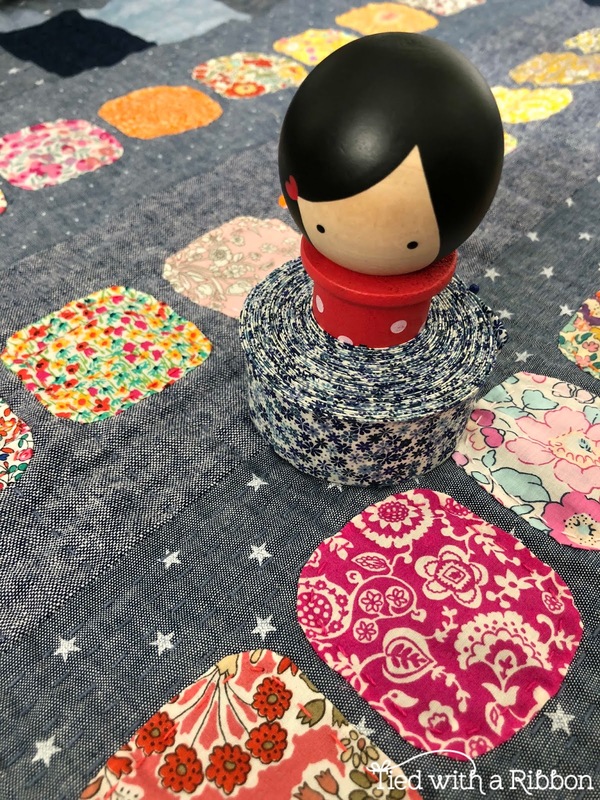 A lot of the Quilts are Fat Quarter friendly which means they are perfect for all those beautiful Bundles you have stashed on your shelves and with Christmas coming - if you are thinking of making a quilt for someone special there is plenty of time with these designs. 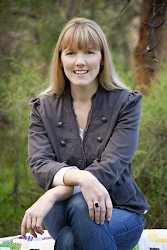 Congratulations Emily on your first book - it is beautiful. Jemima Flendt 2014. Simple theme. Powered by Blogger.